The cover is not flashy, but it is realistic and comforting much like the book itself. The Gentle Art of Swedish Death Cleaning by Margareta Magnusson takes the reader by the hand and says, really you must look at the things around you an make some decisions. After closing the book at the end, I was actually able to open the door of my dreaded, "I will get to that" closet. I released my button and playing card collections from their dusty boxes. I wistfully realized I had left behind lovely pieces of fabric that were purchased in anticipation of sewing projects. Magnusson nudges those reluctant to do so to take on the project of easing future stress by starting to hand off some of the household accumulations now. I came away from reading the book feeling that a competent and wise person had just offered memories of her own life and important advice applicable to so many lives including my own. In my true, collector's spirit, I hope she writes more books! "A slim yet sage volume... 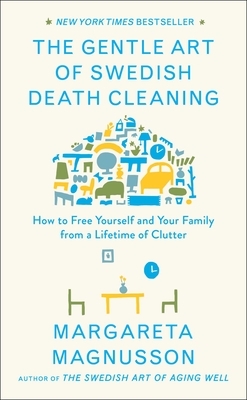 While Japanese item-control diva Marie Kondo gave us strict instructions to only keep things that spark joy, Magnusson’s book is straightforward and unsentimental (with a bit of humor). The main message from this mother of five is: Take responsibility for your items and don’t leave them as a burden for family and friends."